Labor Day marked when two candidates for the upcoming Palmetto Bay Mayoral race took to the same street corner to garner support. 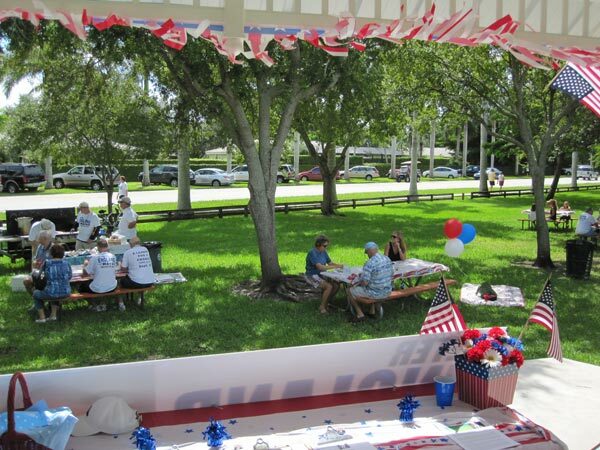 Both Shelley Stanczyk and Peter England brought their supporters out to Coral Reef Park to build awareness in their respective campaigns to replace the terming out Mayor Eugene Flinn. I won't take sides in this blog, but I will say these two candidates certainly see things from different perspectives. About the only thing they did agree on is the new Village Hall. Both say that residents got this at the right time, the right place and the right price. In fact, neither candidates could stop gushing about all the good things that the new Village Hall will bring when it opens this fall. While they shook hands and waved to passerbys, I asked each about what they stand for and why. I also asked about their economic development philosophy for Palmetto Bay. Peter England was concerned about how the current people in government have focused solely on "single family homes" and not the bigger picture of community, which he sees as households, businesses, religious organziations, schools and other groups. He says he'll make sure they are included in his thought process as mayor. He also believes that the issue with Palmer Trinity could have been handled very differently and that the County is very displeased with the way the Village voted on and handled the expansion plans. He said that it is possible that Palmetto Bay might be exposed to upwards of $2M in related legal fees in the coming years. He would have made sure we minimized that exposure. Finally, Peter felt that our best chance for economic development lied primarily on our US-1 frontage. On economic development, Shelley Stanczyk was careful to say that her perspective is to carefully nudge businesses into next steps and getting them to upgrade themselves, as opposed to financially supporting their efforts with Village dollars. She went on to say that both US-1 and the Old Cutler areas could both use an upgrade. She said, "We had a reputation of being the used car place on US-1 and I'd like to see us move toward self-sustaining businesses where people would not have to travel north of 136th Street to shop and eat." Shelley went on to say that anything we do in regards to redevelopment must constantly have input from the local residents that would be most impacted. Today was supposed to be all about the honk and wave, it was tainted a bit by what both would likely call a scheduling conflict. England had set today for a BBQ and picnic, and, as the photo shows, he did just that. However, he says, despite my heavy promotion for the event for weeks Shelley had to show up on the same street corner. He asked me to specifically mention that "if she handles her campaign like she did her event planning, he'll have no problem come November." Shelley told me that there was plenty of room for everyone at the park and that she has done these events for years. This year, her picnic lunch (meant primarily for her staffers) was not held at a friend's house due to a scheduling conflict, so she saw no problem in feeding them right at the park. Regardless of your takeaway, I urge all Palmetto Bay residents to get out and vote. This is a pivotal election since the main man responsible for our incorporation will be term limited. Our next mayor will need to set a course for our next four years.